Music Saves Lives: In Prison - Christopher C. (Kiff) Gallagher, Jr.
“The despair gripped me, like a nightmare had become my life,” said Ms. Ahmad, 26, a shy law student from Malaysia who claims she is innocent of charges of trying to smuggle cocaine on a flight from Caracas to Paris. “But when the music begins, I am lifted away from this place.” Ms. Ahmad plays violin and sings in the prison’s orchestra. A rehearsal of an orchestra and its chorus, above, made up of inmates from the National Institute of Feminine Orientation, a women’s prison in Los Teques, Venezuela. 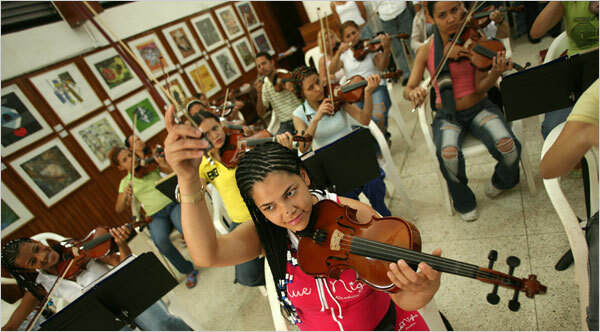 The orchestra is modeled on a system that teaches classical music to poor children.